I've resurrected this install article up from the ashes. In doing so, I've had to replace some of the lost before photos, with text. I've tried to give enough detail information, without going into a ramble, since I didn't shoot photos of every nut and bolt. Once you're working the system, things will become obvious. I hope you find the article useful. Disclaimer: If you're not sure you have the mechanical aptitude, then drop the wrench and stand back. 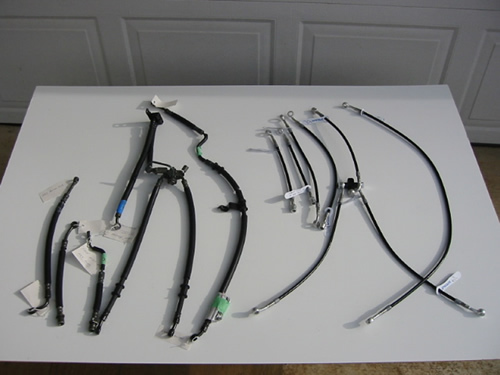 For all intent and purposes, brake lines are brake lines, whether ABS or not. You'll need to exercise some common sense here . Working on any hydraulic brake system is serious business. I will not be responsible for any injuries/accidents or fatal outcomes. Enough said! Hopefully you'll have all the necessary parts and tools needed, before breaking into this project. Having a Mityvac would be ideal, for draining. However, if you're not using one, you'll need some kind of container to catch the fluid. 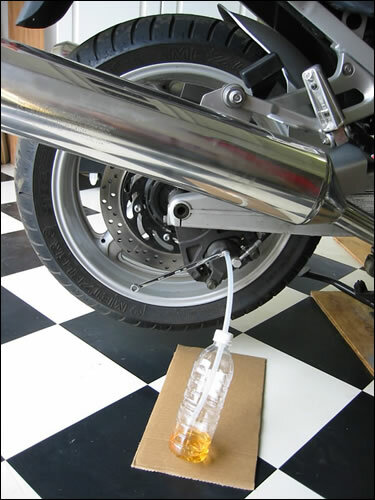 You'll want to clean up any spilt fluid immediately because it's hard on the plastic and painted finishes. Note: I'm only giving parameters here, from my own experience. This is not the "Ten Commandants" written in stone and this is not meant to replace the Service Manual. Take your time! First, you'll need to remove panels "D" and "C" to gain wrenching access. If you're not "plastic savvy", refer to the Dash Panel page for directions on the "how to". I also removed the battery for more working room, but that's your option. If you've got large hands, you'll appreciate any extra room. You'll also need to remove the seats, tank cowling and the "F" side panel. OK, now down to the front lines. I'm working up from the bottom to the top connections here. Remove the wire brake hose holders just above the calipers. Next, drain the lines with your method of choice, either with the Mityvac or catch containers and shop towels. Proceed to break open the banjo bolts at the calipers. After that, move up to where the 3-way is attached to the forks and remove the 2 mounting bracket bolts. Separate the wheel sensor line and push aside. Suggestion: Before undoing the lines where they connect to the hard lines, I would suggest you some how mark or label, at least one of the hard lines. This will prevent possible confusion, when it comes time to reinstall the new lines. You don't want to get the hard lines crossed. There's a securing clamp at the point where the lines connect with the hard lines, just before going into the frame. Before removing the clamp, you may wish to stuff some rags/towels in around the bottom of the fittings. What you want to do here next, is to break loose the fittings, before removing the clamp. Push against or hold the clamp with your right hand, while wrenching with your left. However, if it looks like they are not going to break loose, then you'll need to remove the clamp and separate the lines. 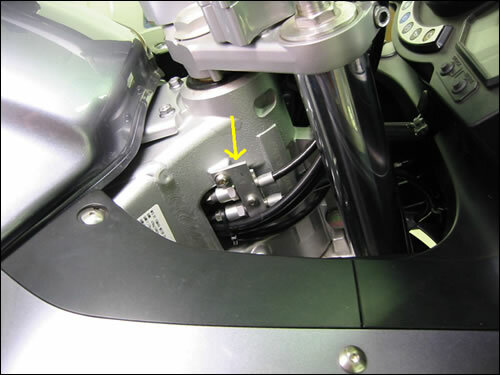 You'll need to remove the bolt, that's on the bottom of the clamp in order to separate and remove. Caution: In regards to removing/installing the brake lines to the hard lines. If the hard line fittings get severely damaged, you're screwed. You'll have to pull the engine to replace the steel lines. Now, after having separated the lines from the hard lines, I removed the wire hose/cable guide on the triple and then the banjo at the reservoir, the lines should now be ready to come out. Wipe up any fluid and proceed on. I decided to remove all the lines first, before installing any new lines, so that's the direction I'm going here. Next up, drain the rear line and remove the banjo bolt, if you haven't done so. 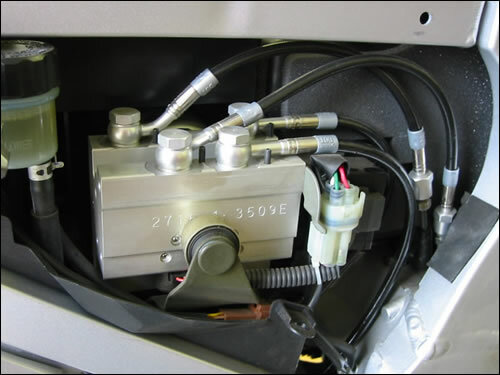 You also should have removed the side panels to access the hydraulic unit. Undo all the line securing clamps. Tip#1: You'll notice there's a small hold down clamp securing the hard lines to the frame. There's also one straight across on the left side of the bike frame. I found that by removing the 2 clamps, it made wrenching the flair-nut fittings a little easier. However, this is optional. Use caution , when wrenching hard lines. You'll need to stuff rags/towels accordingly here, in order to contain any dripping fluid. Tag or mark the hard lines. Proceed to remove the banjo bolts and hard line fittings. Once you've removed the banjo bolts, be careful not to get any dirt inside the exposed pump openings. 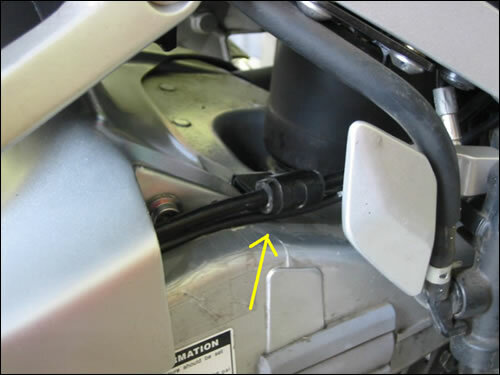 In removing the banjo bolt and line at the rear master, it can be removed with master on or off the bike. I prefer to work on the bench and found it easier to work with it off, then fight with it wrenching on the bike. That's your call. All the old lines should now be off and you should be ready to reverse your order. There's quite a difference between the old and new lines. When you look at the SS lines, you'll notice that they have a natural curve to them. If you do a dry run in the fit-up, you may notice the banjos may need a slight adjustment for a better fit-up, from banjo to banjo. I'm referring to line twist and clearance/rubbing issues here. Here's where that little blue plastic tool and the vice comes into play. Place the banjo in the tool, and then place the tool into the vice. I taped the jaws on a Crescent, along with a 7mm then carefully turned the banjo, to make any slight adjustment. 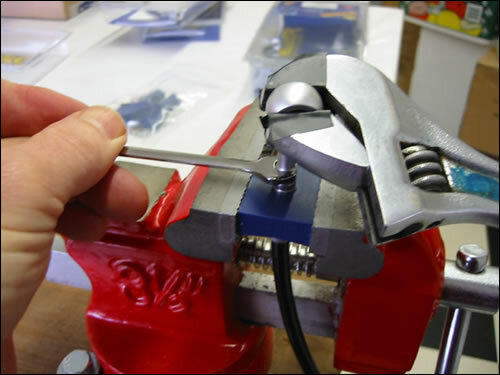 Tip#2: You must use the plastic tool in a vice to make it work, not vise grips. It must be mashed until the blue plastic turns white, at the vise jaws. If this is not accomplished and you attempt to make adjustments, you've just wasted a plastic tool. Use extreme care when making any banjo adjustments! When installing the 2 lines for the hard line fittings, don't tighten the hard line end until the banjo end is in place, with bolt and washers finger tight. Assuming no banjo adjustment is needed and the banjo ends line up where you want them, you can start to tighten up the ends. You'll notice when tightening the banjo bolts, that the banjos will want to creep along with the wrench. Keep in mind that the washers are a one-time use deal! Go slowly and surely, before final tightening. The photo above where I am using 2 wrenches to adjust banjos is from when I did the prototype work. At that time the 7mm was used to adjust the banjos. The kits now come with a white plastic rod, which is inserted into the banjo to make necessary adjustments. You can now forego without the wrenches. Heads-up: The Billet bolts are light and strong. However, improper wrenching will nick up their fine finish. Tip#3: I found that by giving the heads of the banjo bolts a few wraps of Teflon tape, helped to keep from nicking up the fine finish, from a wrench or socket. However, don't get tape under the washer or bolt head. Keeping your wrench or socket square to the bolt, works wonders here. Use 6-pt tools, instead of 12-pt! Caution: Do not tighten the Billet banjo bolts to the stock steel bolt specs. They only require 16-17 lbs torque. You don't want to torque tighten, then go back and undo banjo fittings, if at all possible. If you do need to undo a banjo, you'll need to replace the washers, for they are a 1-time deal. Reusing washers will only make for weeping leaks. Also, it is not recommended to use Teflon tape, anywhere on the system. When the system is installed correctly, there will be no leaks. With the new stiffer SS lines all the securing clamps will not be required. However, for the one rear line clamp, I used a 1" long piece of rubber fuel line, split one side, then slipped it over the line. Then gave it a few wraps of electrical tape, placed the clamp over the hose and mounted. I then secured the sensor line forward the clamp, with a nylon tie. At this point you should be ready to start working on the front lines. Sort out your lines in a dry run fit-up. Check your banjo alignment and adjust accordingly. If you're satisfied with the fit-up, snug up your fittings. Always check for alignment and clearances before the final tightening. Keep an eye on the clearance with the line running from the hard-line, down to the 2-way manifold. Turn the bars to a full left and check clearance and adjust accordingly. 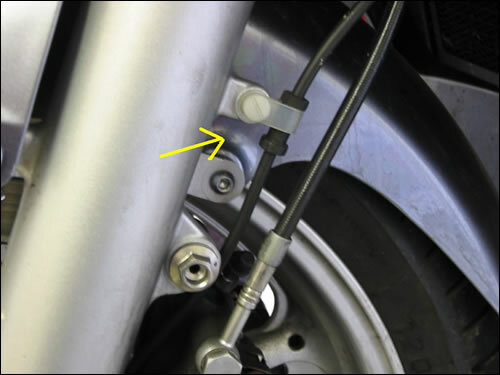 You may need to slot/elongate the mounting bracket holes, in order to shift the manifold to the bikes right, to gain needed clearance. The line should not rub on the cowling sub-frame. I didn't reinstall the wire front brake hose holders, since they're not required with the stiffer lines. One other thing left, is to make your own securing bracket, to secure the lines to the frame where they join the hard lines. I just made up a sandwich clamp from some 1/8" flat stock. As for securing the sensor line at the previous left hose holder, I used a nylon screw and nylon clamp. On top, I nylon tied it to the wire loom. If you're using Speed Bleeders, now's a good time to install before recharging the system. Remove the old bleeders, and then screw the Speed Bleeders in until they seat. Don't ham-fist the bleeders! Fill your reservoir with DOT 4 fluid of your choice, and then prepare to bleed. Bleed the front first, then the rear. Unscrew the Speed Bleeder 1/4 to 1/2 turn. Slowly pump the brake pedal approximately 4-5 times. (You do not have to close the bleeder screw between pumps.) A one-way check valve lets the air and fluid out when the pedal is pressed and closes between pumps preventing new air from reentering the system between pumps. 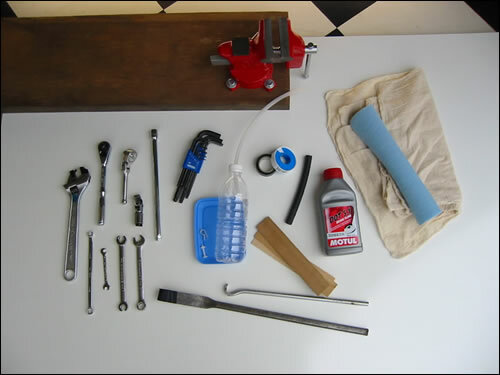 After bubble-free fluid comes out of the Speed Bleeder screw, close the Speed Bleeder until it seats. Proceed to the next caliper until all are bled. Final Note: The manual talks of doing a unit operations test after the system has been disassembled, adjusted, or serviced. 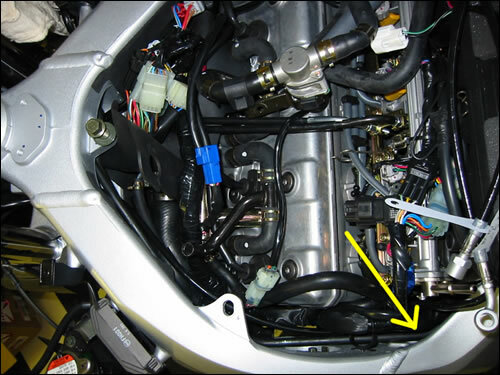 This test requires the Yamaha tool YM-03149, which is basically a jumper wire, to test the system function. To test or not, is your decision, but be absolutely sure your ABS system is working properly. As for any ABS warning light flashes, you'll need to obtain and refer to the supplementary manual. Hopefully everything went well. However, double-check your work, before going out on the highway. I've written a small article for those you've opted for the clutch line install. The job was frustrating without any help from the manual. I'll throw out some pointers, however your technique in removing the line, may vary. To get started you'll need to remove the gas tank for working access. To save space, go to Gas Tank Removal , if you need help. You'll also need to remove the T-bar and rubber covers. After that, you should now be ready to drain the line and remove the banjo bolts. The clutch line is underneath the brake lines and attached to the frame with a clamp. With your light and looking way down, you should see the clamp in question. Follow the line up into the frame, if you need to. Since there's no way to undo the clamp, I took a pry bar and carefully pulled/pried the clamp up, just enough to remove the line. 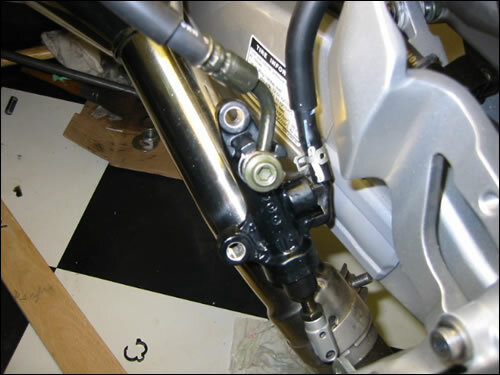 Remove the front hose clamp at the frame. You'll be working it up out from the rear, working your way forward. Since the clutch line lies underneath the brake lines and sandwiched against the frame, some care must be taken in removal. You don't want to damage the brake lines or other components in the process of removing. I taped the end of a bar and also used wooden paint sticks, to separate/wedge and persuade the line up out. Once you see how the line is positioned on the bike, you'll see what I'm referring to. It looks and sounds worse than it really is. It does however come out! Now, the old line should be out. Where the stock line clamp was previously pried up, I carefully bent and returned it back to its original place. At this point, without going into too much detail, it's just a matter of threading in the new line. Check for any (line twist) banjo adjustments that may be needed before final bolt tightening. Take care in securing the line so there's no rubbing/chaffing or pinching of the line or other components. Fill the system, bleed and check for any weeping. Button it all back up. As always, double-check your work, before putting away wrenches and going out on the highway! Copyright © 2005, by Rick Conn and H. Marc Lewis. All rights reserved.